There was a time when Hallmark displayed a holiday earring and/or lapel pin for Christmas and Easter, and Halloween too. Maybe Thanksgiving. I don’t know. The memory eludes me. They may still do this. They were usually on a spinning rack at the counter. 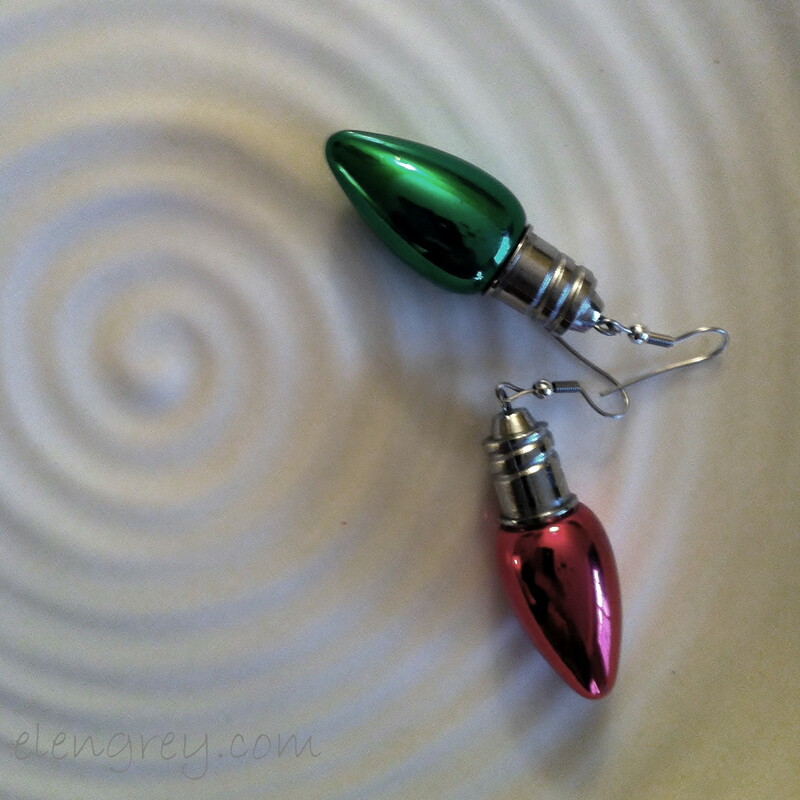 One year — back in the day — they displayed these light bulb earrings right here. I wear them every year during December. 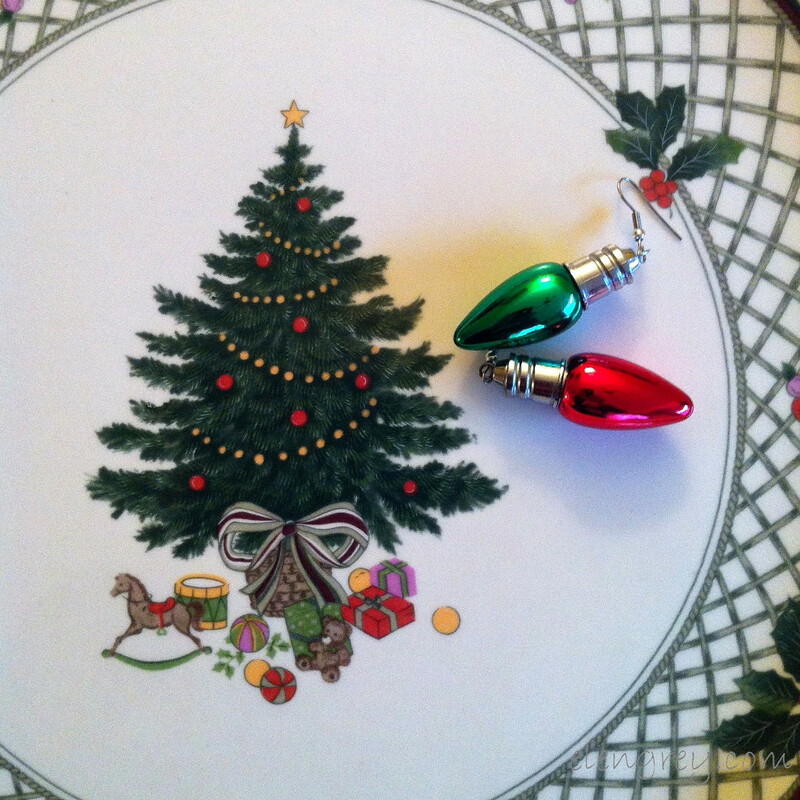 And when they’re not on my ears, they are hanging on the tree. Easy to find. Next up — the reindeer nose. Let’s just jingle right over it. Tell me about that Christmas tie–sweater–hat–elf shoe–whatever you can’t get through the holidays without. Don’t be shy. Love the ear rings. I haven’t seen anything like them here and I’m an ear ring addict! I had a friend who used to buy me the hallmark pins and things for every season. I don’t think they have them any more as I’ve tried to find some for my daughter. I have the best luck at antique/flea markets. Elen, for one minute there I thought we were finally going to see a picture with you wearing the earrings. I happen to have the CUTEST red purse that is velvet, so soft. I tell my daughter that it’s a piece of Santa’s suit. I get tons of compliments. I got it at a thrift shop but I thing it originally came from Old Navy. It seriously is the cutest thing you’ve ever seen. Hahahaha. Well, you never know when you might have an Elen sighting on this blog. It could happen. 😀 So you know what I’m talking about with Hallmark! How I love the purse story. I will never be able to see a piece of red velvet without thinking of your purse and Santa’s suit. Cool earrings. I have a tie with penguins in santa hats and another with santa and a reindeer I wear to school. The kids love them. I don’t have any Christmas apparel, but one thing that has been constant for the last several years has been my need to make the home smell like Christmas. I have a peppermint scented candle in my office, but I also enjoy cinnamon or sugar cookie scented candles (or glade plugins). Actually, any scent that can be construed as “Christmasy” is fair game. Mm. That’s lovely! I would love a whiff of a peppermint scented candle. Does it smell more sweet or more minty? It is very much on the minty side of things. It’s wonderful! Then that would be a winner for me!